From a press release announcing the recent “Polebridge Palace” sale . . .
A property that helped turn Montana’s North Fork Flathead River into a conservation stronghold is changing hands but remaining wild, as The Vital Ground Foundation has teamed up with The Nature Conservancy (TNC) and new landowners on a conservation easement protecting 142 acres of forestland and wildlife habitat known as Polebridge Palace. On the pine-strewn benches above the North Fork Flathead, the area will remain a haven for grizzly bears, Canada lynx, and other sensitive wildlife, as well as a part of the protected Glacier National Park viewshed that annually attracts millions of domestic and international tourists. Meanwhile, TNC can ensure an undeveloped future for a place that once hosted the group’s early momentum-building events in the valley. The agreement includes TNC selling the acreage to new private buyers while donating a conservation easement to Vital Ground, a nonprofit land trust based in Missoula that works to connect and protect key habitat for grizzly bears and other wildlife. The easement stipulates that the new landowners will not develop the forested property beyond its current house and small outbuildings, keeping the bulk of the property preserved as habitat that will help reduce bear-human conflicts in the area. From a recent announcement on the Northeast Kootenai Complex InciWeb site . 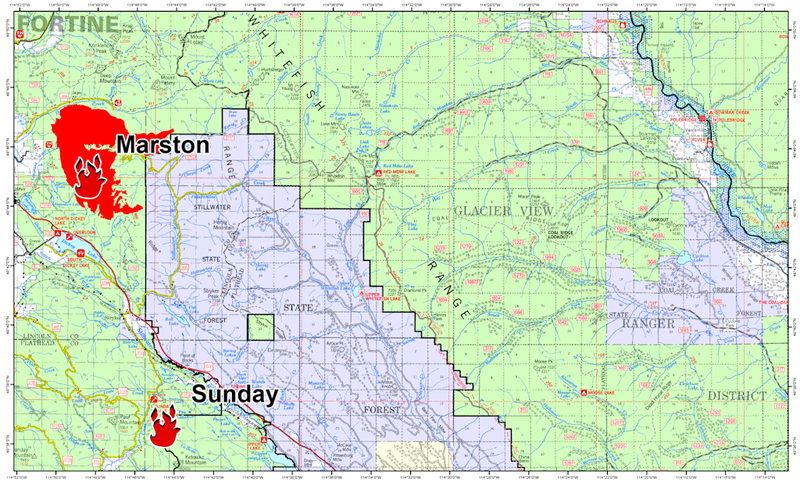 . .
A map of the Marston and Sunday Fires of the Northeast Kootenai Complex showing their proximity to the Flathead National Forest is now posted here on InciWeb and also under the “Maps” tab. This should give residents in Polebridge and other nearby residential areas a better view of the proximity of the Marston Fire to where they live. The fire has NOT moved onto the Flathead National Forest and is approximately 20 miles away from Polebridge. Residents who are concerned about the fire are asked to contact the Northeast Kootenai Complex Fire Information Line at (406) 882-8308 and stay updated on the incident through the Northeast Kootenai Complex InciWeb site. See/click on the map below. For a full resolution version, download the PDF version (1.3MB). With enough wind, the Marston Fire could make a run toward the North Fork . . . 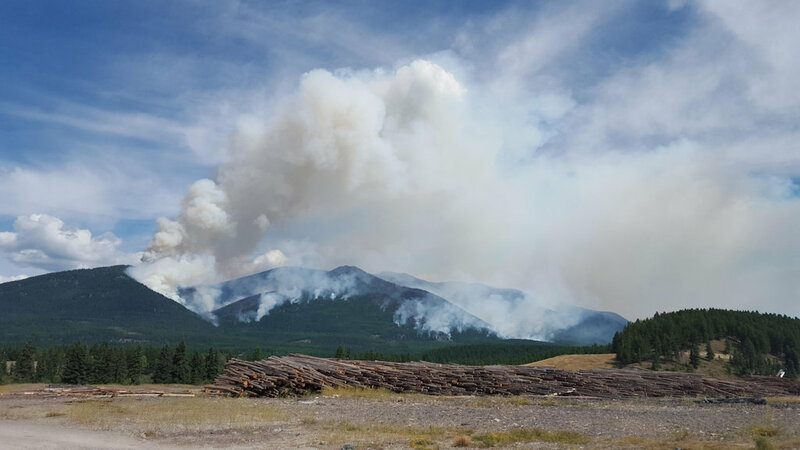 The Marston Fire burning north of Dickey Lake near Fortine gained an estimated 800 acres Friday, pushing northeast toward Whale and Trail Creeks in the North Fork of the Flathead River. The growing fire on the Kootenai National Forest has led to closures of roads and trails on portions of the northern Glacier View Ranger District of Flathead National Forest. Information officer Tom Rhodes said the fire was estimated at 5,500 acres and had advanced to about 2.5 miles southwest of Whale Lake by Friday night. Rhodes said it remains about 15 miles from any residential structures near the North Fork, but critical fire conditions today could push it farther along into the drainages as strong winds are forecast to pick up this afternoon and continue into the evening. Harvey Locke’s presentation at the upcoming NFPA annual meeting gets a mention in this NPR piece . . .
Waterton-Glacier International Peace park connects over the US-Canada border between Montana and Alberta. However, the two parks don’t match up in their cross-border boundary. Glacier Park stretches west to encompass the North Fork Flathead River Valley, but the Canadian Flathead is not part of the Park. 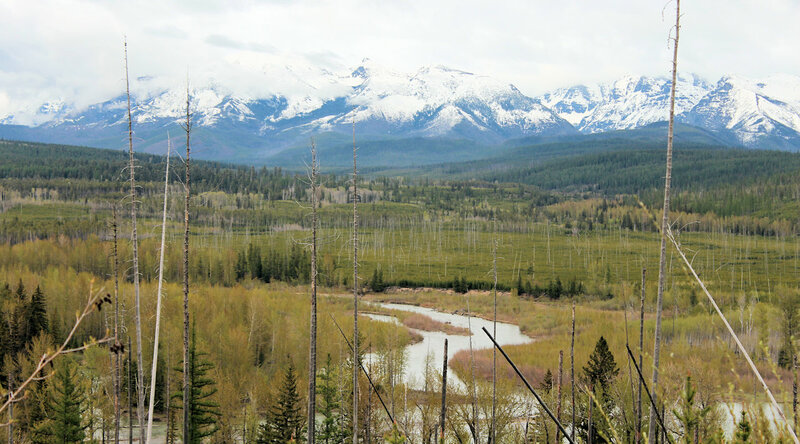 The Canadian Flathead is Provincial land, akin to state or forest service land in the US, and offering the potential for logging or mineral development. Conservationists have been angling to “Complete the Park” by expanding Waterton into the North Fork Valley. This idea of completing the Park is not new. Executive Director of Headwaters Montana Dave Hadden said it’s an effort about as old as the Park itself. John Muhlfield, mayor of Whitefish, weighs in on the political foot-dragging delaying passage of the North Fork Watershed Protection Act . . . Ever since the Great Northern Railway laid tracks through Whitefish in 1904, tourism has been the backbone of our local economy, creating good paying jobs and sustaining thousands of families over the years to put their kids through college, start small businesses, buy a home and retire in one of the most beautiful small towns in America. Hard-working Americans from all over the country come to Whitefish year round. They spend their hard-earned money locally to buy hotel rooms, fill up gas tanks, eat out and support our local businesses – all because they are called to our amazing wild and scenic areas, access to public lands and clean water, and special places such as Glacier National Park and the fresh powder of Whitefish Mountain Resort. In 2013 alone, Whitefish welcomed over 558,000 out-of-state visitors; 65,000 traveled to Whitefish on Amtrak’s Empire Builder. Resort tax and bed tax revenues in Whitefish increased 10 percent and 16 percent respectively that same year. In early April, three senators from Texas, Oklahoma and Pennsylvania blocked bipartisan legislation supported by Montana Sens. Jon Tester and John Walsh and Rep. Steve Daines – Montana’s full congressional delegation – to permanently protect the North Fork Flathead River from future energy development. The bill even has backing from major energy companies, like ConocoPhillips and local businesses, including F.H. Stoltze Land and Lumber Company. But it has stalled for no apparent reason. In a recent poll in the Missoulian, 73 percent said they support permanent protection of the North Fork Flathead River. This week’s Hungry Horse News has nice things to say about Glacier Park’s soon-to-retire North Fork District Ranger Scott Emmerich . . .
North Fork resident Clark Helton was a hunter and a photographer, and he loved Glacier National Park. But he wasn’t in love with some of the Park’s management decisions — biologists were radio-collaring bears and wolves — even elk and deer, and Clark was no fan of man’s intrusion into the natural world. So whenever Helton saw the Park’s North Fork district ranger, Scott Emmerich, he’d give him an earful — often for an hour or more. It got to the point that if Emmerich saw Clark’s pickup approaching, he’d hide lest he be caught up in chat he didn’t have time for. Then one day Emmerich decided to meet Clark on his own terms. He went to Clark’s house at Red Meadow, and the two sat and had coffee, which was unusual because Emmerich didn’t drink coffee. Over the years, the two became friends and went on hunting trips together until Helton’s death. Emmerich continued to manage the North Fork area of the Park with an emphasis on keeping the place rustic. There are no commercial operations in the North Fork, no flush toilets, no cell phone service and no paved roads. That’s how Emmerich likes it. Over the weekend, Jim Mann of the Daily Inter Lake posted a nice article on the recently completed work of the Whitefish Range Partnership . . .
After meeting regularly for 13 months, a group of people representing a highly diverse range of interests recently signed off on recommendations to the Flathead National Forest for long-term management in the North Fork Flathead drainage. And that’s exactly what the privately organized partnership did, meeting roughly twice a month at venues where home cooking and beer were on tap. The idea was to work through differences on wildland fire management, weed management, wildlife, timber management, backcountry trails, mountain biking and trail use, fisheries management, snowmobiling and recommended wilderness. The Flathead Beacon just posted a lengthy, well-written article by Tristan Scott about the just-concluded Whitefish Range Partnership agreement. Like the earlier Missoulian piece, this one is also recommended reading . . . Rob Chaney of the Missoulian posted a first-rate article about the final Whitefish Range Partnership meeting and the agreement’s significance. In the Bible’s First Book of Kings, Solomon nearly has to chop a baby in half before two women claiming to be its mother can resolve their dispute. No swords were pulled at the table where the Whitefish Range Partnership found a way to let loggers, wilderness advocates, snowmobilers, mountain bikers, river rafters and cabin owners share 300,000 acres of the Flathead National Forest. But the roomful of longtime adversaries agreed having a Solomonic deadline actually helped them build the trust to share the land. Last Monday, partnership members shared chili and champagne as they presented Flathead Forest Supervisor Chip Weber with their final agreement. Thirteen months in the making, the deal could help the U.S. Forest Service settle even bigger debates across the Rocky Mountains. The Hungry Horse News posted their article on the recent Whitefish Range Partnership meeting . . .
A group of stakeholders have reached consensus on a collaborative document for future management of the North Fork area. The Whitefish Range Partnership has been meeting for the past several months in preparation for the upcoming Forest Plan revision process for the Flathead National Forest. The meetings were moderated by former state senator and secretary of state Bob Brown, of Whitefish. Most stakeholders said the process went well.